Carnival Cruise Lines are designed for people who want a quick getaway without having to blow the entire budget. Their “fun ships” cruises are especially geared toward the budget conscious traveler. 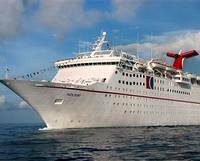 Carnival’s Holiday cruise ship is a classic example. This summer it is doing a five-night circuit through the Western Caribbean. The ship starts and ends in Mobile, Alabama. Along the way it stops in Costa Maya and Cozumel, Mexico. Neither port is spectacular but both have enough going on to keep you interested for a few hours. The big attraction of this type of itinerary is that you get to lounge by a pool on a cruise ship for a few days and stuff yourself silly with food. You also can drink, gamble and forget about life’s worries. Heck, I bet they even show cartoons on board if you ask nicely.